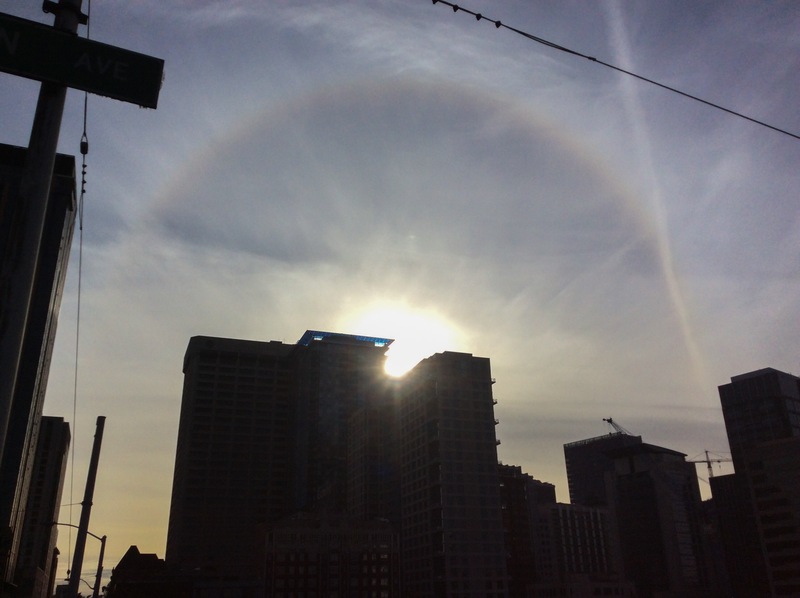 Picture of Today 9/7/15, Halo above the Emerald City..
Coming home after a long pointless walk, I noticed a large circular phenomenon in the sky.. I think it’s an ice halo. I hear these occasionally happen around here in the Pacific Northwest, then dissipate quickly. I wasted no time, and took this shot with my tablet thing. I tried to get to the waterfront for a better, more open shot. But soon, it was gone (about 15 min later). Here’s a bit more from Wikipedia on ice halos, because Im not going to pretend I really know this stuff..
Posted on September 7, 2015 by Orion T.	This entry was posted in Photography and tagged halos, icehalos, optical illusions, PNW, Seattle, sunsets. Bookmark the permalink. Actually, it is an Evening Blessing of the Sky.